Real Madrid manager, Zinedine Zidane, has said his side “will go to death” to defend their Champions League title. The LaLiga giants are seeking to win the trophy for an unprecedented third straight year. They face Bayern Munich in the first leg of their semi-final clash this week, following a 1-1 draw with Athletic Bilbao in the league. Zidane insists his team is well prepared for continental football, despite their shaky domestic form. “This year our problem in La Liga has been like today. “But we are arriving [for the UCL semis] well, physically and mentally, even if today’s result was not so good. “Two games which were a bit poor are not going to change our positivity. We will give everything, go to the death to defend our title. Today the result was not so good, but we must be positive about what we have been doing lately,” Zidane told reporters on Wednesday night. 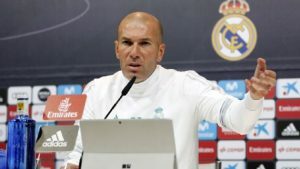 0 Response to "Champions League: Real Madrid “will go to death” to defend title – Zidane"